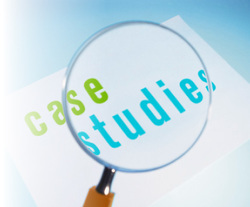 The terminology surrounding "case studies" tends to be confusing, running the gamut from simply "case," to "case history," "case analysis," "case problem," and the familiar "case study". Real world experiences in the classroom and case studies provide them with real life situations for discussion and evaluation. They are particularly useful for business English classes. Jolliffe writes, "through class discussions of the situations and people in the cases, students will hone their insights, perceptions, thought processes and interpersonal skills. . .". According to Silverman the following two factors are as important in Case Study Teaching as they are in any other forms of teaching, perhaps even more so, because an instructor has less control with case discussion than other forms of teaching. What do you want students to learn from the discussion of the case? What do they know already that applies to the case? What are the issues (central and peripheral) that may be raised in discussion? Can the case "carry" the discussion (Is it appropriate to your objectives)? To get started – select a short case study that covers the skills you want your students to practise. Read it several times and consider how it fits with your student-learning objectives for the class (you need to think about why you are teaching this case at this time). Arrange the classroom so that students can talk face-to-face. Prepare a set of questions for students to write out as homework before running the case in class. For class, prepare another set of questions to move students through the stages of case analysis. Who are the people in the case? Where is the case study situated? Why has the situation (problem) occured? What possibilities for action are there? How should the people in the case study proceed? At the end conduct a teacher-led summary and conclusion discussion, assessing what your students have achieved.